The Sigray AttoMap™ is a powerful x-ray analytical microscope with the highest resolution and highest sensitivity laboratory micro x-ray fluorescence (microXRF) capabilities available, enabled by patented technology. Quantitative analysis of thin films, coatings, and buried layers down to sub-atomic equivalent thicknesses and dopants at 10^14 atoms/cm^2 can be obtained through standard-less fundamental parameters or with standards. Thickness variations at the microns-scale can be determined. The AttoMap provides unprecedented sensitivity of sub-femtogram (and sub-ppm) to measure the distribution of multiple elements simultaneously. Applications include: rare earth elements in geological samples, nanoparticles (e.g. 50-100 nm), metallomics, forensics, contaminants in advanced materials, and more. 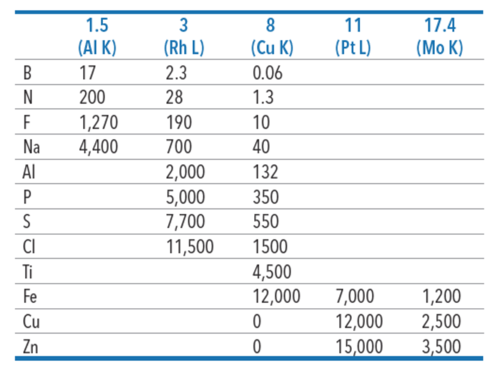 Elemental composition and their relative percentages can be obtained for both point analysis and for larger regions, including specific regions of interest or the complete sample. Data is acquired and stored as a hypermap, with each pixel and its spectra, for ultimate flexibility in analysis. Additional applications of the AttoMap can be viewed in our gallery. Micro x-ray fluorescence is a powerful spatially-resolved elemental mapping and chemical microanalysis technique. Under x-ray illumination, a sample will produce characteristic x-rays that can be analyzed to determine composition. How does the AttoMap achieve its Superior Performance? 50X Brightness: Sigray's ultrahigh brightness x-ray source features an innovative x-ray target comprised of multiple materials in close thermal contact with a diamond substrate. The breakthrough design allows: 1) rapid thermal dissipation through the diamond substrate which allows the x-ray target metals to remain cool under dramatically higher power loading, and 2) linear accumulation of x-rays for laser-like brightness. Fluorescence cross-sections of elements (rows) as a function of excitation energy (column). The selection of illumination energy can affect sensitivity to elements by orders of magnitude. 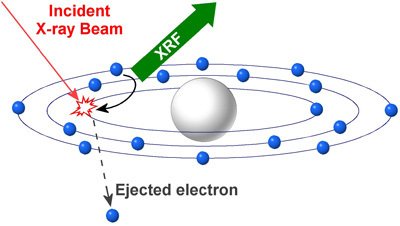 Multi-Energy Target: X-ray fluorescence is highly dependent on the energy of the illuminating x-ray beam and can vary by several orders of magnitude. Sigray's multi-target source provides easy software-selection of target materials to ensure the ultimate sensitivity for each element. No other microXRF system offers multiple x-ray targets. Highest Performance Optic: The AttoMap is the only microXRF that uses a double paraboloidal x-ray optic, which Sigray manufactures through the same proprietary fabrication process it uses to create specialty synchrotron optics. Other microXRFs use conventional laboratory x-ray optics, such as polycapillaries (or tapered monocapillaries). The double paraboloidal optic provides major advantages in: resolution, quantitative capabilities, analytical flexibility, and x-ray flux at the sample. The long working distance and compact form factor of the double paraboloidal x-ray optic enables a unique geometry in which multiple SDD detectors are placed in close proximity to the object to collect 3-4X more fluorescent x-rays for increased analytical speed. Conventional microXRF systems typically place detectors at an offset angle because polycapillary x-ray optics have a well-known "halo effect" that requires an aperture for removal. The AttoMap also features a transmission x-ray detector for 2D microscopy and an optical microscope. Measurement of thin films and dopants with sensitivities down to sub-Angstrom. AttoMap quantification of the composition of different glasses, including contamination and dopants across layers.